Throughout the Caribbean and the Bahamas, industrial facilities Hurricane Storm Protection are burdened with waste streams that require storing on the premises until dewatering and either recycled or disposed of in a landfill. 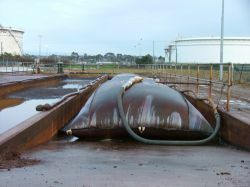 Facilities can save money on disposal costs by reducing the volume of spoils or sludge translates. Use of a mechanical dewatering process is expensive and time consuming. Caribbean GeoTextiles provides geotextile tubes and bags that are far more cost effective than traditional methods of dewatering and is part of an industry that is growing by leaps and bounds. Your Caribbean project will benefit from installing these tubes into the waste stream. They can also be used for Hurricane Storm Protection desilt lagoons and other waterways and use of environmentally safe polymer encourage the sludge to flocculate, thus improving the dewatering rate and improving filtrate quality. In the Caribbean, GeoTextile tubes and bags are used successfully to dewate industrial sludges, including lime, gypsum, alum, titanium dioxide, fly ash, pulp and paper and phosphate, and is fast becoming the choice of dewatering over the older, mechanical traditional methods. Contact us today to learn how our products can help you save money on your next project in the Bahamas, Exumas and Caribbean Islands such as Trinidad and Tobago, Aruba, Puerto Rico, Turks and Caicos, Bermuda, Virgin Islands, Antigua, Cayman Islands, Grenada, Bonaire and more including Belize. Call SDMI dba Caribbean GeoTextiles at 770-831-8111 or click here to contact us by email.